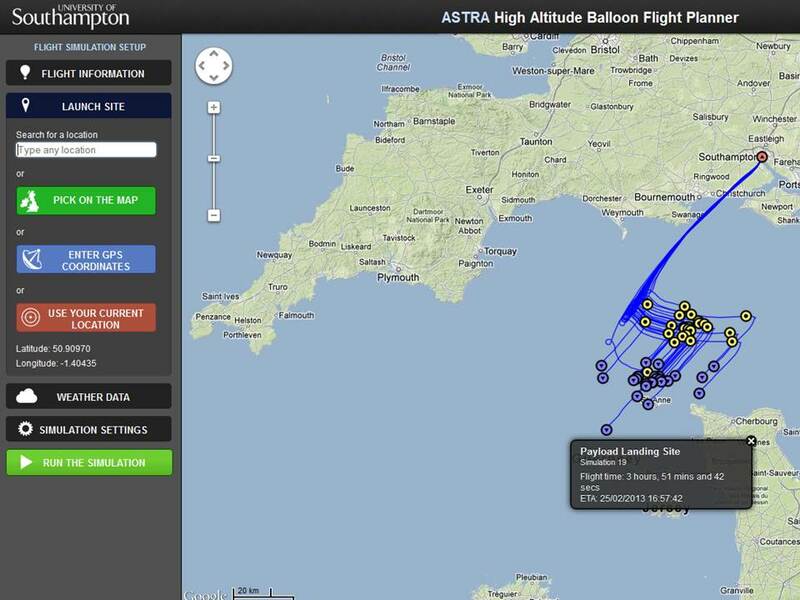 We have launched our new high altitude balloon flight planner. Using a Monte Carlo approach, the planner computes an ensemble of simulated flight paths, with appropriate distributions imposed on a variety of physical parameters (drag coefficient variations, balloon burst diameters, etc.). The latest weather forecast (high altitude wind, temperature and pressure profiles) is downloaded each time a simulation is run. By default, the simulator will assume that the balloon will rise until it bursts and then it descends on a parachute (a number of common balloon and parachute types can be selected from a database), though station keeping (floating) flights can also be simulated. 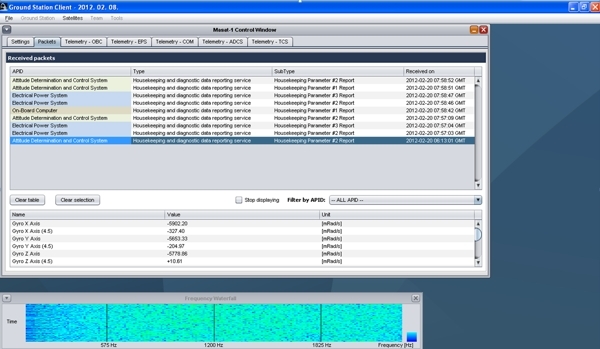 The simulation engine runs on a Windows Azure cloud server, enabling the use of the planner from low powered devices (tablets, smartphones, etc.). The ASTRA team will present the detailed description of the model behind the planner at the forthcoming Decelerator / Balloon Systems Conference of the American Institute of Aeronautics and Astronautics (to be held at the end of March in Daytona Beach, Florida). The planner is free to use and can be accessed by visiting the ASTRA web pages and clicking on the Balloon Flight Planner link. Can a stratospheric instrument platform be miniaturised to the extent that it can be carried aloft by a beach ball sized balloon? Our new radio transmitter, which today’s flight set out to test, weighs in at less than 30g, together with its 3d-printed housing. Together with this miniature payload, no dimension of the balloon exceeded 2m at any point during the ASTRA 13 flight, which, launched from Southampton, crossed the South Downs early this morning. The transmitter, designed by PhD student Matt Brejza, worked perfectly throughout the 50 minute stratospheric hop, being tracked by the ASTRA transceiver station at the University of Southampton, as well as by our chase car (equipped with a portable receiver station and an antenna), which followed the ground track of the balloon through the South Downs. We collected the payload a few minutes after its touchdown, inside the 50 percentile contour plotted by the pre-flight Monte Carlo trajectory simulation, near the West Sussex town of Midhurst. Within four hours of the launch, the ASTRA team was back at the University of Southampton Highfield Campus. The very small size of the balloon and the transmitter itself lends the system extreme flexibility in deployment, opening up the possibility of fast response, ad-hoc observations of short duration, transient meteorological phenomena. A residential summer course organised by the Smallpeice Trust was delivered in partnership with the University of Southampton Faculty of Engineering and the Environment and Microsoft. The students had the opportunity to experience some of the technologies used or developed by the ASTRA team over the last year. Ramjet – Pupils in the ramjet laboratory. Day one began with a welcome talk from Prof. Simon Cox, followed by an icebreaker session and a tour of the Highfield campus, including demonstrations of one of the wind tunnels, a ram jet engine, a 3D printer, and a visit to the Iridis 3 supercomputer, one of the largest computational facilities in the UK, and named as the fastest Microsoft Windows-powered computer in all of Europe. Building computers – Pupils assembling supercomputer. After lunch and an introduction to supercomputing, the students were set the task of building supercomputer nodes from scratch with boxes of commodity hardware. Their day did not end there: next they were given an introductory talk on ‘Engineering the Perfect Wing’, followed by an excercise involving the use of a flow analysis code to design an aerofoil optimisation for minimum drag. Flight simulation – Pupils in the University’s flight simulator. Day two started with a talk on ‘Computers and Simulations in Aerospace Engineering’ by Dr Andras Sobester. The students were then set their challenge for the week; each team was asked ‘What role do you see computers playing in the development of aircraft engines, cabins, fuselages, landing gears, galleys. During the rest of the day the students then got the opportunity to fly in the University’s state of the art flight simulator. In the morning the students were also given a talk on ‘Exploring the Atmosphere and its Impact on Aviation’. The talk included an introduction to ASTRA. In the afternoon the students were introduced to rapid prototyping, which began with a talk on 3D printing and .NET Gadgeteer, including a live coding demo by Dr Steven Johnston. The students then had the opportunity to get their hands on the .Net Gadgeteer kits, and each team was given their own sensors to program. Phone app – Students working on WP7 app. Day three started early with a lecture on ‘Exploring the Atmosphere – the Role of Computer Simulations.’ The task was to use the ASTRA trajectory prediction code to simulate the flight of a balloon launched from the University campus. By changing the type of lifting gas, balloon and parachute type, as well as the amount of helium pumped into the balloon, they were required to ‘land’ the virtual flight as close to a target landing site as possible. Next came an introduction to Windows Phone 7 including a live demo of how to write and deploy an app using Visual Studio. The teams of students were then each given an HTC Surround phone, and asked to develop a location app with guidance from the team at the Microsoft Institute for High Performance Computing at the University. The app had to display the location of a simulated balloon launch on a map, providing the user with flight information. WWT – Data visualisation in the World Wide Telescope. After lunch, the students were joined for the rest of the day by Mr Geoff Hughes from Microsoft Academic Relations, who gave a very interesting Q&A session. The afternoon was based around the concept of visualising ‘Big Data.’ After a World Wide Telescope (WWT) demo, the students were asked to visualise the data gathered by the ASTRA 8 launch, using WWT. The students also took part in a presentation practise and critiquing session before their talks the following day. The students then got the opportunity attend a formal dinner in The Hartley Suite along with other Smallpeice Trust course attendees. The winners – The winning team. Day four began with a final briefing and last minute tweaks to the students’ presentations. Then at 11:00 everyone gathered for the team presentations, delivered to the Associate Dean for Enterprise and Chair of the Faculty IT Forum. All of the talks were of a very high standard but there could only be one winning team, and each member received a signed copy of ‘Stratospheric Flight: Aeronautics at the Limit’ and a model of the first day’s optimized aerofoil, created using one of the Faculty’s 3D printers. Gadgeteer winners – Two of the students left with Gadgeteer kits as prizes. Two other lucky students were selected for an outstanding achievement during the week, each received a .NET Gadgeteer kit courtesy of Microsoft Research UK. Looking back on the week, a great time was had by all and it’s nearly time to start organising next year’s course! Thanks to Microsoft for all their generous support, and a special thanks for lending us the Windows Phones and the .NET Gadgeteer kits which made the event possible. A key goal of the ASTRA initiative is to reduce the development cycle time of a high altitude atmospheric research platform to mere days from specification (that is, the definition of the space, weight, power and exposure requirements of the instruments to be flown) to test flight. The ASTRA Cube demonstrator was conceived to test two key rapid prototyping technologies we aim to use towards this goal: additive manufacturing and rapid electronic prototyping. ABS-based 3d printing represented the former here, while for the latter we used .NET Gadgeteer (an open-source toolkit for building small electronic devices using the .NET Micro Framework and Visual Studio/Visual C# Express). 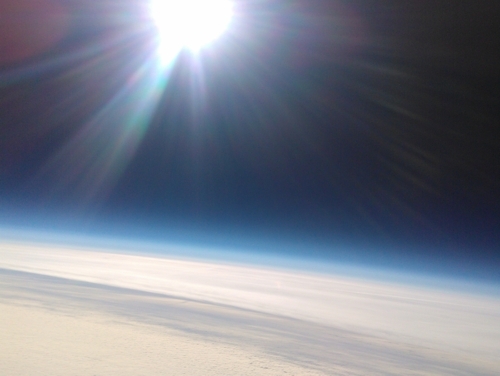 Launched from a MetOffice research facility, during its stratospheric flight lasting just over 4 hours ASTRA 12 reached a peak altitude of just under 35km (~115,000 feet), during which it recorded temperature (dipping to -61C), pressure, humidity and images, as well as key parameters of its trajectory. The imagery captured by the small Gadgeteer camera included the sunset picture shown above, which, incidentally, also depicts the gravity waves picked up three hours earlier by ASTRA 10. The clip below illustrates the rapid development process which the ASTRA Cube resulted from. ASTRA 10 was one of a series of flights designed to provide calibration data for the ASTRA balloon trajectory simulation code. The flight, conducted in collaboration with the MetOffice, was also aimed at testing the feasibility of using a Nokia Lumia 800 smartphone (running the Windows Phone 7.5 operating system) as a communications, tracking, data logging and imaging device. 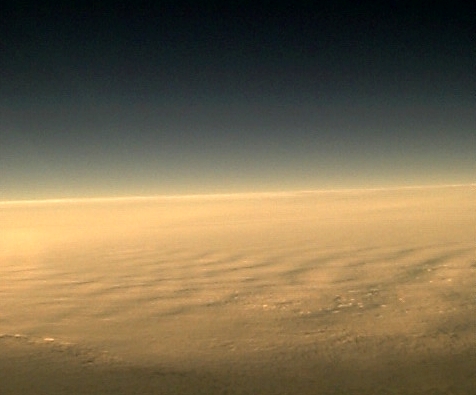 Airborne for 2 hours and 22 minutes, ASTRA 10 reached an apogee altitude of over 32km (~105,000 feet), and, in addition to trajectory data, it captured over 2GB worth of imagery, including shots of gravity wave clouds above South Wales. These are generated by an airmass being forced to rise in a stable atmosphere. Eventually gravity will bring the airmass back down, but it will overshoot its equilibrium height, rising once again – this process repeating multiple times creates the ripple effect seen on the picture below. Internal Gravity Waves – Gravity wave clouds, as seen by ASTRA 10. Payload train – ASTRA 10 ready for launch. The latest iteration of the ASTRA atmospheric research glider flew from a series of air-launches this morning. 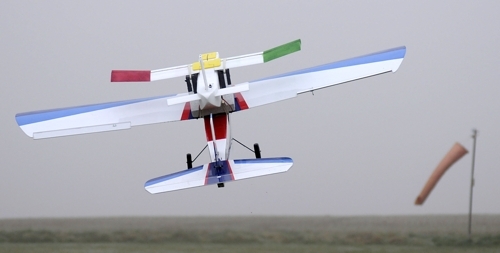 Carried aloft by a larger (powered) ‘mother ship’, the glider successfully completed a number of flights over a cold and misty Southern Hampshire. Glider released at the top of the climb. Designed for robustness and versatility, the glider has a release mechanism, which enables flights from high altitude balloons. On this occasion the powered RC mother ship was used as a low cost alternative to the multiple balloons such testing would have required.